The boys of One Direction love their tattoos. In particular, Harry, Zayn, and Louis seem to be the most distinguished of ink connoisseurs. How many tattoos does Louis Tomlinson have? It seems like there may be too many to count, but devoted One-Directioners have done it. If you tally them up one-by-one, Tomlinson has 33 tattoos altogether at the moment. HOLY MOLY!! Thirty-freakin-three!!! There are more tattoos on his body than there are letters in the alphabet, and they seem to be multiplying exponentially by the hour. Some are big, like the stag on his bicep. Most of them are small enough to probably have been Friday the 13th tattoos. Some stand alone, like the tat proclaiming "It is what is it" across his chest. But the majority of them are clustered within his sleeve that takes up the majority of his right arm. In fact, he has SO MANY tattoos that people have made maps of his body to track which symbols are located where. Now, that takes a lot of research and careful examination of Louis Tomlinson. Kudos, whoever you are. But in the vast ink canvas that is the skin of Tomlinson, there are a few pieces of artwork that stand out. 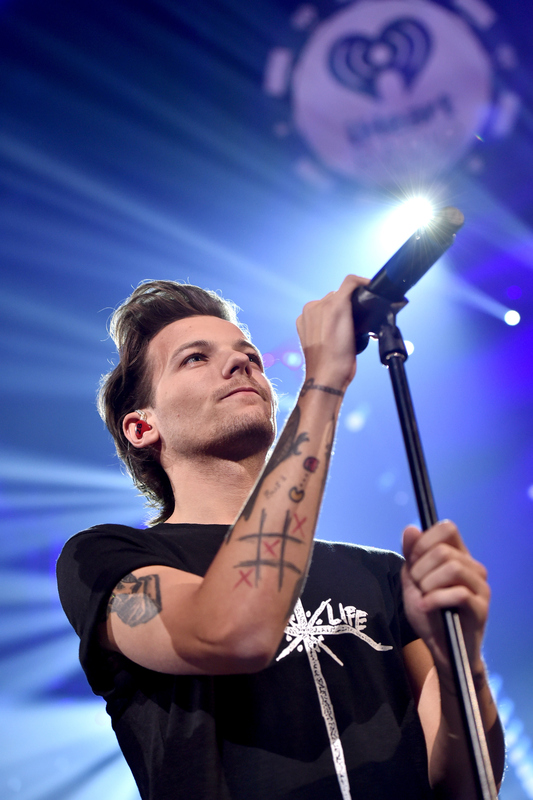 Here are Louis Tomlinson's six most prominent tattoos, broken down. In March of 2013, Tomlinson's girlfriend Eleanor Calder revealed the singer's newly inked ankle tattoos. As an homage to his high school band "The Rogues," Tomlinson got "The Rogue" imprinted on his ankles. No matter where he goes, he's still Louis from the block. OK, so maybe this isn't the most conspicuous tattoo, but at least is has meaning behind it. If you'll notice the little scribble right above the tic-tac-toe board, you can see a tat that reads "Bus 1." In August of 2014, Tomlinson and Zayn Malik visited an LA tattoo parlor and got this matching tat. According to K Pop Starz, the tattoo is supposed to symbolize the boys' home while on tour. Brothers from other mothers, those two are. In May of 2013, Tomlinson debuted a big ol' deer on his right bicep with a heart between its antlers. While it's unclear what the meaning of this piece is for sure, I'm guessing this what he imagines his patronus to be. Everyone knows about Harry Styles' pectoral birds, and well, the same people who know about those are probably cognizant of the fact that Tomlinson has a swallow tattoo. Only, it's on his right forearm. When Tomlinson got this tattoo in January of 2013, the Examiner speculated that the meaning may have to do his fear of birds (totally didn't realize that was a thing). There hasn't been any confirmation of this theory, but I like the idea of Tomlinson using "flooding" to squash his phobia of feathery animals that chirp in the daytime. Hey, this one has a meaning behind it! According to Pop Star Tats, Tomlinson's mother revealed on Twitter in September 2013 that this was the number of house that his grandmother and grandfather lived at. D'aww!! In March of 2013, the Tomster got what seems to be the most self-explanatory tattoo of all of his tattoos: "It is what it is" written in brush script across his chest. It's either his own existentialist mantra, or some meta-statement about the meaning of his tattoo — that it's just a tattoo. Furthermore, let it be known to the world that this writer voluntarily googled "Louis Tomlinson shirtless" to find the above picture. She is a grown woman, and these are the things that she does with her day.